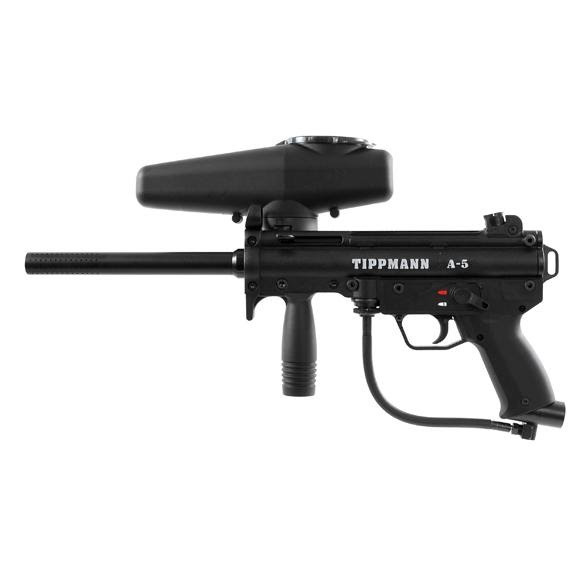 Since its launch back in 2002, the Tippmann A-5 has become one of the most popular scenario markers in the industry featuring the patented cyclone feed system and the ability to field strip in less than 60 seconds. The goal of this new redesign was simply to make this popular marker better while maintaining the overall aesthetic appearance. Since its launch back in 2002, the Tippmann A-5 has become one of the most popular scenario markers in the industry featuring the patented cyclone feed system and the ability to field strip in less than 60 seconds. The goal of this new redesign was simply to make this popular marker better while maintaining the overall aesthetic appearance. key changes include a new cyclone feed system, new external selector switch, larger front grip and a new stock barrel. These changes, plus many other modifications, are all designed to enhance the marker&apos;s reliability, accuracy and make it even easier to modify. In addition, the A-5 Flatline barrel with built-in foregrip is available as a separate accessory.